Oct. 21, 2013 6:00 a.m. The Wetaskiwin & District Heritage Museum will induct four more women into the Women of Aspenland exhibit on Saturday, October 19th, at 2:00 pm. The Women of Aspenland exhibit honours the essential place women had in the development of Wetaskiwin City and County by preserving the memory of some of these outstanding individuals and their the huge contributions and abilities. Una Dowswell is an exceptional representative of the many farm wives who cared for the house and children, helped in most every aspect of farm operations, and still found time and energy to develop their talents and provide assistance and leadership in the community. Always a hard worker, the standard that Una set in her home was exemplified by completing each day's meals with dessert after supper. She grew a huge garden which supplied the family with vegetables, fresh or frozen, all year round. Blossoms from her flower garden won her blue ribbons at competitions and awards from the Wetaskiwin Mall for floral arrangements. Especially during seed time and harvest, Una helped with the farm work and earned her husband's remark that she worked harder than any other man on the farm. Among Una's greatest accomplishments were her many beautifully decorated cakes. From making very special birthday cakes for her family, she progressed to baking and decorating cakes for many weddings and parties. When the daughter of a former mayor of Edmonton was married, Una Dowswell baked and decorated the wedding cake. The 13 foot cake for the 75th Anniversary celebration for the City of Wetaskiwin was also one of her creations. She always made the cakes for each of her grandchildren's birthdays, too. In the community, Una contributed in a number of ways. She had a gift for making others feel comfortable even when they were terrified, a very useful talent in her decades at the Wetaskiwin swimming pool where dozens of adults who were afraid of the water learned to swim in her one-on-one lessons. As an accomplished artist, she was constantly learning new techniques in oil painting, water colours, acrylics and more. Her love of crafts included teaching ceramics at both Rosebrier School and the Wetaskiwin Arts Centre. She was known for her talent for teaching. When her daughters were in 4-H, she volunteered help with the gardening club and led the sewing club. Community involvement was important for her and her family, including the many ball games and picnics. The family also enjoyed travelling Alberta, from a Sunday at Red Deer Lake to weekends visiting a zoo, sightseeing in Banff, or camping. A leader in her passion for education, she insisted upon all of her children attending university or other post-secondary education. Una was born September 26, 1925, in Ferintosh, Alberta, the second youngest of Ileza and Jens Olsen's seven children. She completed Grade 11 from Red Deer College before marrying Charles Dowswell in the spring of 1945 and moving to a house on the Dowswell's homestead at Angus Ridge. There they raised five children: Dale, Roy, Arlene, Lori, and Robyn. She always worked hard, keeping house and the farm running smoothly, helping with seeding and harvest, caring for gardens, animals, and children, cleaning and cooking, even working and volunteering outside the home and helping others. She loved arts and crafts which she shared through her talent for teaching. She was an encouraging example and inspiration to all who knew her. Una passed away on April 29, 2008. Birdie Walker worked hard and made the best of each stage of life, always having constant care and concern for others. She experienced tragedy and illness as well as adventure, always finding strength, comfort and peace in her Christian faith. She was only in Grade 9 when she left the overcrowded Brightview one-room school and went to Wabamun to help care for a sick cousin and child. After attending the 1939-1940 school year at Prairie Bible Institute, she tried various jobs before working as a cashier in the Aboussafy Grocery Store for six years. In 1947, she married John Dawson Walker. Together, they farmed west of Wetaskiwin and had three boys and two girls, Bruce, Brian, Linda, Sharon, and Ken. After John's death in 1970, she spent three summers on Devon Island, now in Nunavut, cooking for university students doing research. In the fall of 1973, she started working at the Wetaskiwin Nursing Home, first with housekeeping and later as a nursing attendant. After her retirement at age 65, her involvement with seniors branched out to include being a live-in caretaker, and to providing transportation as needed. She has also travelled to many places. Quilting and ceramics have been favourite activities. Clearly, the stages of life for Birdie have been more varied than for most people, especially when also considering her bouts of illness, which included tonsillitis, polio, rheumatic fever, cataracts, two different thyroid cancers and a mastectomy. She credits her faith and hope in Christ for the calm she felt at these times, and her farming heritage, of caring for herself while keeping active, for her recoveries. Birdie was an active participant in farm activities. During harvests, she put long hours into cutting the grain and working the binder. She helped to milk the cows, separate the cream, then delivered the cream to the Wetaskiwin Creamery. While the children were growing up and involved with 4-H, she spent eight years as the assistant leader of the girl's gardening club, and as leader of the clothing club. Birdie was also active with the Wetaskiwin Ladies' Aid, and during her time as president, learned skills which she now finds very useful in her present position of Secretary for the Peace Hills Association Pioneer Club. Teaching Sunday School to young teens and Child Sponsorship through World Vision give evidence of her ongoing concern for children. Her love for travelling has taken Birdie to Scotland 10 times since her elder daughter, Linda, moved there. However, she has also travelled around the world visiting United Arab Emirates, Singapore, and New Zealand on one trip, but her travel log also includes two trips to each of Egypt and the Holy Land, as well as visits to Fiji, Denmark, Germany, Italy, and Greece, and a more recent trip back to her birthplace in Missouri. Born in Missouri in 1920, she came to the Wetaskiwin area with her family, parents Ollie Goldman and Susan Cosby Brashear and six siblings, when she was five years old. At 93, Birdie is less active, but still drives, quilts, plays Scrabble, and has time for her family. She is an excellent example of a life well lived. Ruth Tessari remembers her years as a house mother at Bethany Homes for Children as her main ministry, especially the years from 1996 to 1999 when she and her first husband, John Shields, were house parents in a new house, providing their vision of more family-oriented care for the children as compared to the original dorm care. However, she had been the house mother for the boys dorm in 1966 to 1971 while her husband, John, was the farm supervisor at Bethany Homes. After more than a decade away, the Shields returned to Bethany Homes staff in 1984, doing much of the administrative work after the Jespersens, who founded Bethany Homes in 1948, retired in 1991. She continued to help as much as she could at Bethany Homes for a couple years after John passed away in 1999. Ruth was born into a life of Christian ministry. Her father, Ernest Benjamin (E.B.) Anderson, a minister in the Swedish Mission Covenant Church, had been born in Minnesota and ministered in rural areas across the three prairie provinces. Her mother, Dorothy, a teacher, was also of Swedish descent and had been born in Iowa. The second of six Anderson children and the only girl, Ruth was born in Camrose on January 27, 1931, attended school for Grades 1 and 2 in Weyburn Saskatchewan, Grades 3 to 9 at the Havelock School near Minnidosa, Manitoba, and High School at the Prairie Bible Institute in Three Hills, Alberta. After a year helping at home while her mother taught school at Skiff, Alberta, Ruth returned to P.B.I. for the four years of Bible School and remained there on staff until her marriage to Robert John Shields, a farm worker, in 1959. The Shields remained at Three Hills for a few years and had two children, Ernest Paul in 1960, and adopted four week old Faith Ann in 1964. They were at Bethany Homes from 1966 to 1971, then moved to the Peace Country where they worked near Sexsmith and then near Bezanson. After Ruth's father passed away in 1974, the Shields moved to Gwynne to be closer to her widowed mother. While there, Ruth was active in the Gwynne church, teaching Sunday School classes and leading a club for young people providing Biblical teaching, crafts, and singing. Ruth moved into Luther Manor in Wetaskiwin in 2001. While there she helped lead exercises for the residents of the Good Shepherd Home, and was chair for the Wetaskiwin Christian Singles Group. In 2004 she married Ernest Joseph Tessari. After a couple years in Nanaimo, B.C., they moved back to Wetaskiwin to a house they built here. Ruth now lives in the Good Shepherd Home and is a member of the family-resident committee. She enjoys day trips with her husband in a wheelchair-accessible van and keeps in contact with her children and grandchildren. Annie French is described as having been a proper lady known for her grace and composure, humble, gentle, and kind. She cared for her family, joined and actively worked in women's service clubs, and delighted in the relaxed atmosphere of summers at Ma-Me-O Beach. She enjoyed doing fancy needlework such as petit point and cross-stitch, but also willingly used her skill with a needle to mend clothes. Her family remembers her as a good cook who made perfect saskatoon pies. Annie Florence was born February 21, 1898, at Angus Ridge the fourth child of Robert MacLachlan (R.M.) Angus and Florence Donaldson, who had moved from Quebec in 1892. In 1903, the family moved into Wetaskiwin. In all, ten children were born to the family, but sadly, three little girls died as toddlers, leaving three girls and four boys to grow up. Little is known about the children's schooling, but there are abundant stories about the summers at Ma-Me-O Beach. Like a number of Wetaskiwin families, the mother and children spent much of the summer in tents at Ma-Me-O while the fathers worked in town during the week and came out on the weekends that the dirt trail out was not too muddy. R.M. Angus set up two tents, one for cooking and the other for sleeping. When there were visitors, fishing was necessary and Annie would help cook extra. For the children, those summers at the lake were wonderful times of exploration, freedom and adventure. Annie considered them the best times of her life. Annie worked at the Star Store for some time in her teens. In 1920, Annie married Horace Roderick (Frenchie) French who had come from Quebec in 1909. He worked in the jewellery store, and soon bought it, turning it into French's Jewellery. Annie occasionally helped in the store, especially during the busy seasons. She and Frenchie had a baby girl that died when very young, and two boys: Charles Roderick in 1924 and Malcolm Angus in 1927. Mac carried on as a jeweller. Rod became an optometrist. Each married and had two children, giving Annie four grandchildren to enjoy, and later three great-grandchildren. The French family also spent their summers at Ma-Me-O, with one improvement—they had a cabin. There were still no modern conveniences such as power, gas, or running water. Annie loved to pick berries to make jars of pin cherry jelly and saskatoon pies, both family favourites. In 1977, Annie received a 50 year pin for her faithful work with the Imperial Order of Daughters of the Empire (I.O.D.E. ), a volunteer organization dedicated to strengthening the Wetaskiwin community by adhering to their motto “Contributing to Community and Country.” She also earned a 25 year pin for her membership in the Order of the Eastern Star. 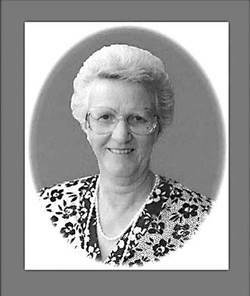 Throughout her life, she was an active member of the Anglican Church Women's Group. She enjoyed the companionship of the women in these groups, but also had the satisfaction of working together to help people in a way that she couldn't accomplish by herself. After Frenchie passed away in 1974, Annie continued her community involvement, enjoyed her grandchildren, and kept in touch with her large circle of friends. Her granddaughter, Marg, enjoyed her company, shared her passion and talent for art, and said of her that, “It seemed like everything Annie did, she did well and she did with love, thoughtfulness, and care.” Annie passed away in 1986 with her sons by her side.